Attila (c. 406 - 453 C.E.) was the monarch of the Hun people from 434 C.E. until his death. His empire stretched from the Netherlands to the Ural River and from the Danube River to the Baltic Sea. 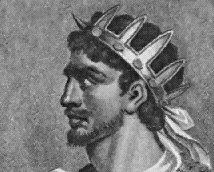 During his rule, he was one of the most fearsome of the Roman Empire's enemies: he invaded the Balkans twice, besieging Constantinople on the second invasion; he marched through Gaul (modern day France) as far as Orleans before being defeated at the Battle of Chalons; and he drove the western emperor Valentinian III from his capital at Ravenna in 452. 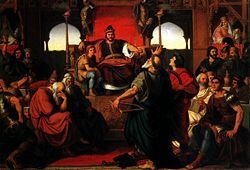 Although some histories lionize Attila as a great and noble king, and he plays major roles in three Norse sagas, in much of Western Europe he is remembered as the epitome of cruelty and rapacity. Though his empire died with him, he became a legendary figure in Western history and tradition, being known as the grim "Scourge of God." The origin of the European Huns has been the subject of debate for centuries. However, there is general agreement that they were a confederation of Eurasian and European tribes that appeared in Europe in the fourth century. The Huns achieved military superiority over their rivals—most of them highly cultured and civilized—by their readiness for combat, unusual mobility and horsemanship, and weapons such as the Hun bow. Nothing is known about Attila's youth except for the day he was born. He first appeared in the historical record when he became joint king of the Huns with his brother, Bleda. While his belief system was unknown, Attila seems to have had little interest either in Christianity or other religions. The Hunnic Empire stretched from the steppes of Central Asia into modern Germany, and from the Danube River to the Baltic Sea. By 432 C.E., the Huns were united under Rugila, whose death in 434 left his nephews Attila and Bleda (the sons of Rugila's brother Mundzuk) in control over all the united Hun tribes. At the time of their accession, the Huns were bargaining with Byzantine emperor Theodosius II's envoys over the return of several renegade tribes who had taken refuge within the Byzantine Empire. The following year Attila and Bleda met with the imperial legation at Margus (present day Požarevac) and, seated on horseback in the Hunnic manner, negotiated a successful treaty. The Romans agreed not only to return the fugitive tribes (who had been a welcome aid to Rome against the Vandals), but also to double their previous tribute to the Huns of 350 Roman pounds of gold. They also opened their markets to Hunnish traders, and paid a ransom of eight solidi for each Roman taken prisoner by the Huns. The royal brothers, satisfied with the treaty, retreated from the empire and returned to their home, where they consolidated and strengthened their empire. Theodosius used this opportunity to strengthen the walls of Constantinople, building the city's first sea wall. He also built up his border defenses along the Danube. Attila and Belda remained out of Roman sight for the next five years as they tried to invade the Persian Empire. A defeat in Armenia caused them to abandon this attempt and return their attention to Europe. In 440, they reappeared on the borders of the Roman Empire, attacking merchants at a market on the north bank of the Danube. Attila and Bleda threatened further war, claiming that the Romans had failed to fulfill their treaty obligations and that the bishop of Margus had crossed the Danube to ransack and desecrate the royal Hun graves on the Danube's north bank. They then crossed the Danube and laid waste to Illyrian cities and forts on the river. When the Romans discussed handing over the offending bishop, he slipped away secretly to the Huns and made his own peace with them, enabling them to take the city of Margus. Theodosius had stripped the river's defenses in responding to earlier battles against the Vandals at Carthage in 440 and the Sassanids in Armenia in 441. This left Attila and Bleda a clear path through Illyria into the Balkans, which they invaded in 441. The Hunnish army, having sacked Margus and Viminacium, took Singidunum (modern Belgrade) and Sirmium before halting. A lull followed in 442, and during this time Theodosius recalled his troops from North Africa and ordered a large new issue of coins to finance operations against the Huns. Attila and Bleda responded by renewing their military campaign in 443. Striking along the Danube, they overran the military centers of Ratiara and successfully besieged Naissus (modern Niš) with battering rams and rolling towers—military sophistication that was new to the Huns. Then, pushing along the Nisava Riva, they took Serdica (Sofia), Philippopolis (Plovdiv), and Arcadiopolis. They encountered and destroyed the Roman force outside Constantinople and were only halted by a lack of siege equipment capable of breaching the city's massive walls. Theodosius admitted defeat and sent the court official Anatolius to negotiate peace terms, which were harsher than the previous treaty: the Emperor agreed to hand over 6,000 Roman pounds of gold; the yearly tribute was tripled, rising to 2,100 Roman pounds; and the ransom for each Roman prisoner rose to twelve solidi. Their demands met for a time, the Huns withdrew into the interior of their empire. According to the historian Jordanes (following Priscus), sometime during the peace (probably around 445), Bleda died, reportedly killed by Attila. Now undisputed lord of the Huns, Attila again turned towards the eastern Roman Empire. Mór Than's painting The Feast of Attila, based on an account of the historian Priscus (depicted at right, dressed in white and holding his history):"When evening began to draw in, torches were lighted, and two barbarians came forward in front of Attila and sang songs which they had composed, hymning his victories and his great deeds in war. And the banqueters gazed at them, and some were rejoiced at the songs, others became excited at heart when they remembered the wars, but others broke into tears." The barbarian nation of the Huns, which was in Thrace, became so great that more than a hundred cities were captured and Constantinople almost came into danger and most men fled from it. … And there were so many murders and blood-lettings that the dead could not be numbered. Ay, for they took captive the churches and monasteries and slew the monks and maidens in great numbers (Callinicus, Life of Saint Hypatius). A luxurious meal, served on silver plate, had been made ready for us and the barbarian guests, but Attila ate nothing but meat on a wooden trencher. In everything else, too, he showed himself temperate; his cup was of wood, while to the guests were given goblets of gold and silver. His dress, too, was quite simple, affecting only to be clean. The sword he carried at his side, the latchets of his Scythian shoes, the bridle of his horse were not adorned, like those of the other Scythians, with gold or gems or anything costly. He rejoiced at this gift and, being ambitious, thought he had been appointed ruler of the whole world, and that through the sword of Mars supremacy in all wars was assured to him (Jordanes, The Origin and Deeds of the Goths, ch. XXXV). 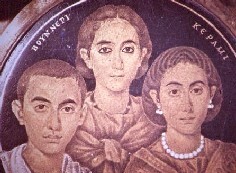 Honoria (center)—with her brother Valentinian III and her mother Galla Placidia—sought Attila's aid in escaping from an unwanted arranged marriage. As late as 450, Attila had proclaimed his intent to attack the powerful Visigoth kingdom of Toulouse, making a military alliance with Emperor Valentinian III in order to do so. He had previously been on good terms with the western Roman Empire and its de facto ruler Flavius Aëtius. Aetius had spent a brief exile among the Huns in 433, and the troops Attila provided against the Goths and Bagaudae had helped earn him the largely honorary title of magister militum in the west. However, Valentinian's sister Justa Grata Honoria, in order to escape her forced betrothal to a Roman senator, had sent Attila a plea for help—-and her engagement ring—-in the spring of 450. Attila, not unreasonably, interpreted her message as a proposal of marriage. He accepted, asking for half of the western Empire as dowry. When Valentinian discovered the plan, only the influence of his mother, Galla Placidia, convinced him to exile Honoria rather than killing her. He also wrote to Attila strenuously denying the legitimacy of the supposed marriage proposal. Attila, not convinced, sent an embassy to Ravenna to proclaim that Honoria was innocent, that the proposal had been legitimate, and that he would come to claim what was rightfully his. 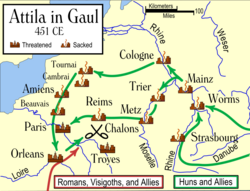 Map of Attila's campaigns in Gaul. Meanwhile, the king of the Salian Franks had died and the succession struggle between his two sons drove a rift between Attila and Aetius; Attila supported the elder son, while Aetius supported the younger, who may have been Merovech, founder of the Merovingian line, though the sources—-Gregory of Tours and a later roster from the Battle of Chalons—are not conclusive. He gathered his vassal—Gepids, Ostrogoths, Rugians, Scirians, Heruls, Thuringians, Alans, Burgundians, among others—and begun his march west. In 451, he arrived in Belgica with an army reported by Jordanes to be half a million strong. On April 7, Attila captured Metz, and Aetius moved to oppose him, gathering troops from among the Franks, the Burgundians, and the Celts. Attila's continued westward advance convinced the Visigoth king Theodoric I to ally with the Romans. The combined armies reached Orleans ahead of Attila, thus checking and turning back the Hunnish advance. Aetius gave chase and caught the Huns near Châlons-en-Champagne. The two armies clashed in the Battle of Chalons. Theodoric was killed in the fighting and Aetius failed to press his advantage, according to historian Edward Gibbon because he feared the consequences of an overwhelming Visogothic triumph as much as he did a defeat by Attila. Attila returned in 452 to claim his marriage to Honoria anew, invading and ravaging Italy along the way. The city of Venice was founded as a result of these attacks, when the residents would flee to small islands in the Venetian Lagoon. His army sacked numerous cities and razed Aquileia completely, leaving no trace of it behind. Legend has it he built a castle on top of a hill north of Aquileia to watch the city burn, thus founding the town of Udine, where the castle can still be found. Valentinian fled from Ravenna to Rome; Aetius remained in the field, but lacked the strength to offer battle. Attila finally halted at the Pol where he met an embassy including the prefect Trigetius, the consul Aviennus, and Pope Leo I. After the meeting, he turned his army back, having achieved neither Honoria's hand nor the territories he desired. Several explanations for his actions have been offered. A pandemic and famine which coincided with his invasion may have caused his army to weaken, or the troops that the new Byzantine emperor Marcian sent across the Danube may have given him reason to retreat, or perhaps both. Priscus reports that superstitious fear of the fate of Alaric I—-who died shortly after sacking Rome in 410—-gave him pause. Prosper of Aquitaine's pious version of events, represented by the drawing of Raphael above, says that the Pope, aided spiritually by Saint Peter and Saint Paul, convinced him to turn away from the city. Whatever his reasons, Attila left Italy and returned to his palace across the Danube. From there, he planned to strike at Constantinople again and reclaim the tribute which Marcian had cut off. (Marcian was the successor of Theodosius and had ceased paying tribute in late 450 while Attila was occupied in the west.) However, Attila died in the early months of 453. The conventional account of his death, from Priscus, says that on the night after a feast celebrating his latest marriage to the beautiful and young Ildico (Thompson 1948, 164), he suffered a severe nosebleed and choked to death in a stupor. An alternative theory is that he succumbed to internal bleeding after heavy drinking. Another story of his death, first recorded eighty years after the fact by the Roman chronicler Count Marcellinus, reports that "Attila, King of the Huns and ravager of the provinces of Europe, was pierced by the hand and blade of his wife. The Volsunga saga and the Poetic Edda also claim that King Atli (Attila) died at the hands of his wife, Gudrun. Most scholars reject these accounts as no more than romantic fables, preferring instead the version given by Attila's contemporary Priscus. Priscus' account, however, has recently come under renewed scrutiny. Michael A. Babcock (2005) concludes that the account of natural death, given by Priscus, was an ecclesiastical "cover story" and that Emperor Marcian was the political force behind Attila's death. Attila's warriors, upon discovering his death, mourned him by cutting off their hair and gashing themselves with their swords so that, says Jordanes, "the greatest of all warriors should be mourned with no feminine lamentations and with no tears, but with the blood of men." His horsemen galloped in circles around the silken tent where Attila lay in state, singing in his dirge. They then celebrated a strava (lamentation) over his burial place with great feasting. Legend says that he was laid to rest in a triple coffin made of gold, silver, and iron, along with various spoils of his conquests. His men diverted a section of the Tisza Riva, buried the coffin under the riverbed, and then were killed to keep the exact location a secret. His sons Ellak (his appointed successor), Dengizich, and Ernakh fought over the division of his legacy, specifically which vassal kings would belong to which brother. As a consequence, they were divided, defeated, and scattered the following year in the Battle of Nedao by the Ostrogoths and the Gepids under Ardaric, whose pride was stirred by being treated along with his people like chattel. Thus Attila's empire did not outlast him. Attila's many children and relatives are known by name and some even by deeds, but soon valid genealogical sources all but dry up and there seems to be no verifiable way to trace Attila's descendants. This hasn't stopped many genealogists from attempting to reconstruct a valid line of descent from antiquity for various medieval rulers. One of the most credible claims has been that of the tsars of Bulgaria. A popular, but ultimately unconfirmed, attempt tries to relate Attila to Charlemagne. Artist's rendering of Attila the Hun (made centuries after his death). There is no surviving first-person account of Attila's appearance. Historians do have a possible, second-hand source, however, provided by Jordanes, a controversial historian, who claimed Priscus described Attila as: "short of stature, with a broad chest and a large head; his eyes were small, his beard thin and sprinkled with gray; and he had a flat nose and tanned skin." In the West, Attila's name has become a byword for cruelty and barbarism. Some of this may have arisen from confusion between him and later steppe warlords, such as Genghis Khan and Tamerlane. All are considered to be cruel, clever, and blood-thirsty lovers of battle and pillage. The reality of his character is probably more complex. The Huns of Attila's era had been mingling with Roman civilization for some time, largely through the Germanic foederati of the border, so that by the time of Theodosius's embassy in 448, Priscus could identify two primary languages among the Huns, Gothic and Hunnic, with some people knowing Latin and Greek. Priscus also recounts his meeting with an eastern Roman captive who had so fully assimilated into the Huns' way of life that he had no desire to return to his former country, and the Byzantine historian's description of Attila's humility and simplicity is unambiguous in its admiration. The origin of Attila's name is not known with confidence. Historical linguists believe, as the evidence suggests, the name is Gothic (or Gepid), from the word atta ("father") and the diminutive suffix -ila. Attila was not a rare name in Central Europe, and the historical record has numerous persons with the name before Attila, himself. Not surprisingly, Bleda's name also seems to have come from Gothic. Attila's name has many variants: Atli and Atle in Norse; Ætla, Attle, and Atlee in English; Etele and Attila in Hungarian; and Etzel in modern German. ↑ Villanova University, Embassy to Attila. Retrieved June 1, 2007. ↑ The Latin Library, Marcellinus Comes. Retrieved June 1, 2007. ↑ The Internet Sacred Texts Archive, Atlamol En Gronlenzku. Retrieved June 1, 2007. Portrait of Attila the Hun. The Decline and Fall of the Roman Empire, Chapter 34. The Origin and Deeds of the Goths. History of "Attila the Hun"
This page was last modified on 6 December 2016, at 00:12.